Clogs in your underground drainage system can cause many problems like backing up your gutters and downspouts, having to call a plumber to clear out your drainage system, or even replacing the entire system, which can become very expensive. DrainSavers allow easy removal of leaves and debris from your downspout and keep that debris from going into your underground drains. 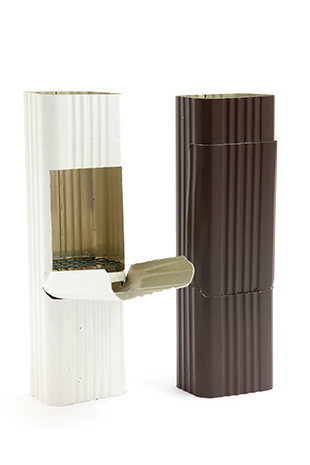 DrainSaver is constructed to mimic the look of your existing downspouts. They have a hinged trap door that is locked by one quarter-inch zip screw on either side. The trap door allows for easy access to clean out the collected debris. Inside the DrainSaver is a metallic wire grate that strains anything larger than 0.0625 square inches. For comparison’s sake, that’s about the size of a pencil eraser. If you are interested in purchasing this product, or if you would like more information, please contact us.